The manner clouds form in the sky help weather watchers estimate the activity and severity of a thunderstorm. Take for example scud clouds. These clouds often precede wall clouds which may later on produce a tornado. Therefore, learning more about this cloud form will help you anticipate the occurrence of a tornado. But what is a scud cloud? Scud clouds are detached cloud formations found on the base of cumulonimbus clouds. It occurs as a result of water vapor condensation under the base of a storm cloud due to the presence of huge amounts of moisture in the outflow region of the storm cloud. Scud cloud is totally harmless but it may develop into a wall cloud once it rises and moves laterally toward the inflow region of a thunderstorm. At What Height is Scud Clouds Found? These clouds develop at lower cloud level which is below 6,000 feet from the Earth’s surface. Their occurrence signifies intense wind shear beneath the thunderstorm cloud allowing them to move faster and disperse rapidly. Scud clouds may not bring precipitation but the accompanying thunderstorm cloud does in the form of rain and hail along with lightning and strong winds. How do Scud Clouds Form? 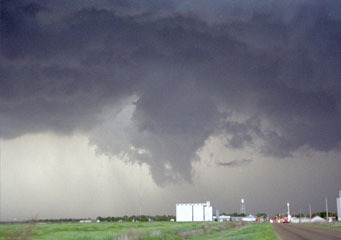 Scud clouds form when water vapor condenses at the lower cloud level. It occurs when cold air from the thunderstorm’s outflow lifts up the relatively warm air. As warm air is lifted, it eventually condenses and because of the strong wind shear occurring at lower altitudes, the thunderstorm cloud pushes it outward. That is the reason why it is completely detached from the storm cloud. On the other hand, scud cloud may also develop when the thunderstorm’s updraft draw in cool air from the outflow (or downdraft). If this process is coupled with lateral movement, the scud cloud will move toward the updraft, rise and eventually develop into a wall cloud. What do Scud Clouds Look Like? Due to strong wind shear happening near the ground, scud clouds look like cloud formations that have broken off underneath thunderstorm clouds. Their torn out and shredded appearance is also due to wind shear. The bases are not well-defined and dark in color; they are sometimes persistent and found very near the ground. Scud clouds generally look like torn out pieces of cotton balls floating in the sky. How common are Scud Clouds? These clouds are common in any location of the globe. However, they are frequently seen in regions where severe thunderstorms and tornadoes develop such as the Central Plains of the United States. Scud clouds may be harmless but if you notice any rotation, then a tornado must be developing.